From Corey Rosenbloom: Like Lucy and the football with Charlie Brown — always frustrating him at the last minute — the Market fell rapidly to the rising 20 day EMA target for a third time. Will bears be able to break through it this time and kick the football? Or will buyers pull the football away from the bears, leaving bears frustrated once again? From the August 2017 reversal low, price retraced toward – and then reversed up away from – the rising 20 day EMA (green) three times. 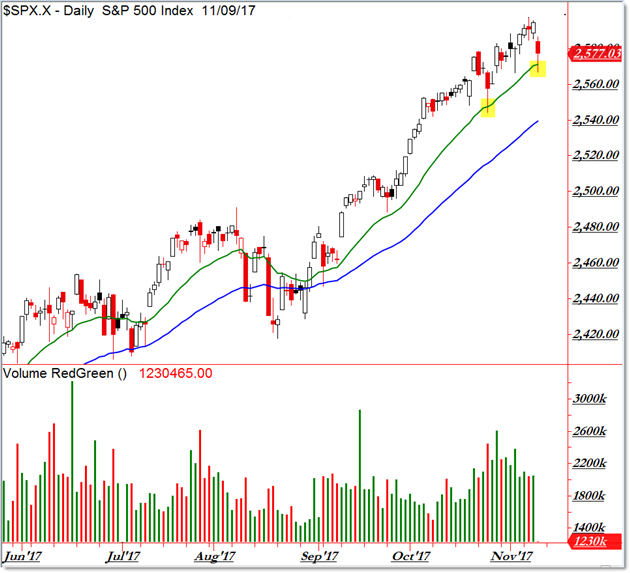 Today’s major sell session – which we should compare to October 25th – collapsed the market straight toward the key rising EMA. We’ll monitor what happens NOW but then, buyers rushed in to buy the dip and create a V-Spike intraday reversal up away from the EMA target, resulting in a continuation of the ongoing bull market. Whatever strategy – intraday or swing trading – you’re using, pay close attention to how today’s session closes and whether or not we trade up away from the moving average once again. Either way, frame your short-term trades in terms of the immediate departure from the 20 day EMA line which trades near 2,575’s critical bull/bear short-term pivot. Stay tuned as we continue to give you more daily updates and market commentaries! The SPDR S&P 500 ETF Trust (SPY) fell $0.71 (-0.28%) in premarket trading Friday. Year-to-date, SPY has gained 16.56%. SPY currently has an ETF Daily News SMART Grade of A (Strong Buy), and is ranked #1 of 135 ETFs in the Large Cap Blend ETFs category.